Despite bipartisanship displayed during the state budget passage just one night before, House Republicans were up in arms Friday over an accusation that they were raising fees, contrary to their campaign rhetoric. 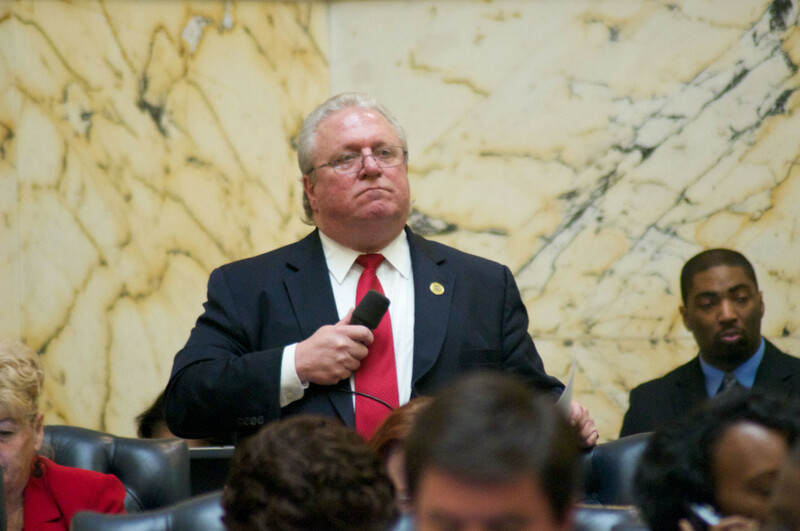 The dispute arose Friday morning from a question by Del. Craig Zucker, D-Montgomery, about HB 542, a Calvert County bill to double a $10 appearance court fee to $20 to finance the Calvert County Law Library Fund. “If the gentleman wants to turn this into a partisan attack on this floor, in this manner…by continuing to attack the Republican members of this body, let him do it. Throw down the gauntlet,” said Del. Anthony O’Donnell, R-Calvert and St. Mary’s. O’Donnell, the bill’s sponsor, argued that a fee imposed on lawyers filing appearances in order to fund the legal library is not a partisan issue and should not be referred to as one. Zucker was not deterred, “Would that show up as number 41 on taxes and fees?” he asked. Minority Leader Nic Kipke, Anne Arundel County, saw this as a perfect chance to chime in, reminding the body of taxes and fees during past years, a continuing theme of Gov. Larry Hogan and other Republicans. Kipke said that the “countless taxes and fees raised by the General Assembly over the last eight years” were moved to the point that they no longer paid for what was intended. Some legislators were ready to move forward in a more bipartisan fashion. Speaker Michael Busch had the last word. “I don’t think anyone is attacking anyone, he just asked a question,” said Busch. He then asked if anyone wanted to add anything, which was met with a round of laughter from delegates. The bill passed second reading and will have a final vote in the House before it moves onto the Senate.